Ok. This is actually a problem with Evernote. It's a bit convoluted, but essentially Evernote will move your internal PDF every time that you open it and/or annotate it. So you open it once, and it puts it in path path/to/pdf/x, then you export the annotations where the links are are to path x. However, it only lives in path/to/pdf/x temporarily, so when you go and click those links, nothing is there. Thus the error. In order to fix this right now, you will have to keep a local copy of the PDF (i.e. not in Evernote). I will investigate if there is some way for me to find a stable location for your Evernote pdfs. OK. I should have a solution in version 2.2.1, which I've just pushed to Packal. It appears that Evernote renames the temporary directories to temp_dir.backup after you fiddle with the PDF. So, my new URL handler will try the original Evernote path, but if there is an error, it will try the .backup path instead. So, you will see the same dialog box saying that the file doesn't exist, but if it does actually exist, once you select "Ok", it will open the PDF. What does the debugger say when you try to export Skim notes? Can modify skimmer_config_new_embed in Acrobat Pro but not in Skim. Can modify skimmer_config_new in Skim. I set new colours, Set Highlights, ... then used these colours in a PDF I am reviewing, export, get the same Debug reporting on export. It looks like the annotations didn't survive with the export of the workflow. I had skimmer_config_new_embed in the folder for some tests. You have to modify skimmer_config_new in Skim to set the Highlight Colors. Cannot do it in Acrobat. It appears that since Skim annotations are extended attributes, they won't make it thru the uploading and importing that Alfred does. So, you are going to have to make your own version of the Config page 2. In order to get things working for now, you will need to annotate the Help PDF yourself. 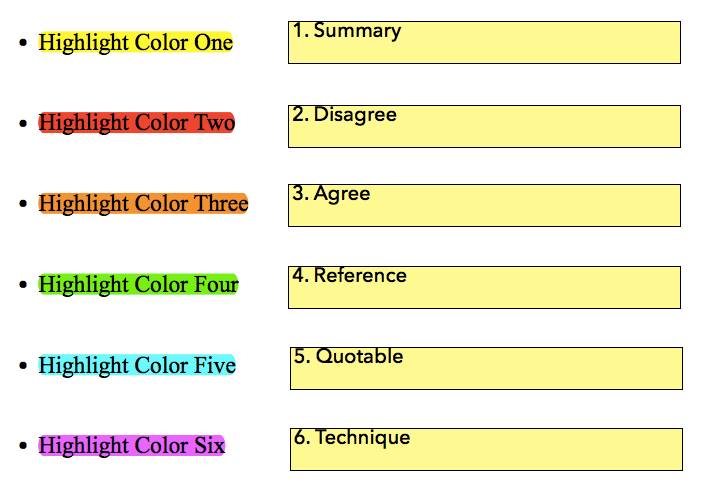 Highlight the six "Highlights" with your preferred colors. Then create 6 Text Notes. For each note, number it (1 thru 6 followed by a period [.] and a space) and then give the text you want for that color. Simply ensure that it looks like the image in the post above. For reference, here is what page 2 of the Help PDF needs to look basically like (with different colors and text). Note that the numbers at the beginning of the Text Notes are **KEY**. I thought the main problem was html2text, so I installed it throughout python, but I do think it was quite a good idea, mostly because it didn't resolve the problem! First, what version of the workflow do you have? Second, what version of Skim do you have? Third, you did have the config PDF open when you tried to set the highlighting colors, correct? The second error in the debug log would suggest that Skim wasn't open (or at least a Skim document wasn't open). I will have to add more beers, because I have another problem! I get the error -10810 telling me that "the application "_skimmer" can't be opened. This is unfortunately an unknown error. So, we need to learn more about what's happening when. Does this happen everytime you click a Skimmer link? What are your Gatekeeper settings? When you open the workflow folder and double click the _skimmer.app, what happens? Here's a thought. Open the workflow folder and simply try to open the _skimmer.app. What happens? Just did, and now everything works perfectly! Perfect. I need to update the documentation. Seems that the app only works once you launch it first. Likely, it needs to be launched in order to register the URL scheme with the system. Update: Version 3 is now live on Packal. It includes a major update to the annotation exporting feature. Now, you can export as either HTML or Markdown, to either Evernote or the Clipboard. Plus, highlights are now grouped together by color (and thus by whatever text tag you give said color), and these groups are sorted alphabetically. User-customization of export is also rebuilt, making it more customizable where it needs to be, but less customizable where it doesn't. Also, a new option under sk:help to launch the URL Handler app so that Skimmer's custom URL scheme is registered with the OS (you might need to alter you Gatekeeper settings for this, as this is an "unsigned app"). All in all, this is a great update. Hope you enjoy. UPDATE: There was a bug in version 3 for exporting notes. I have just pushed version 3.1 to Packal. This fixes the export bug, so the new features from 3 are now fully functional. UPDATE: Version 3.2 now properly formats the line breaks for all annotation types, not just Highlights. Sorry for the bug. Upgrade on Packal now. Thank you very much and I adore Skimmer! It has helped my workflow a lot! In 3.2, the help PDF is not a Skim PDF but a regular PDF, so you will need to "File -> Convert Notes..." first, then alter the highlight colors and text categories.